These 14k Solid Gold Chakra balancing rainbow earrings are your dream pair of yoga inspired hoops. These round multi gemstone hoop earrings measure about 1 1/4 inches wide. 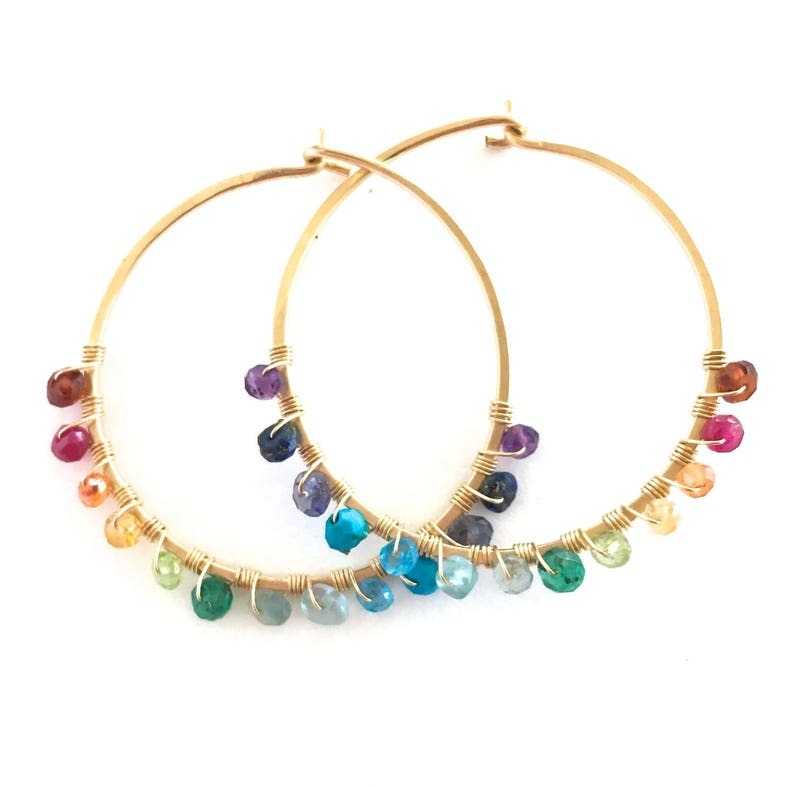 Each individual pair of hoops are hand hammered for texture, shine and strength and wire wrapped with small genuine gemstones in every color of the rainbow. They are fun, lightweight and simple. Gemstones included are: garnet, ruby, orange carnelian or tourmaline, citrine, peridot, emerald, aquamarine, topaz, turquoise, iolite, lapis lazuli and amethyst. Your earrings will arrive gift wrapped. 14k solid gold will last a lifetime if cared for properly. Care instructions are included with each purchase. Would you like a matching necklace? Have other questions? Concerns? I'd love to chat with you! Large Aquamarine Gemstone Hoop Earrings. Sterling Silver Hand Hammered Large Round Blue Hoop Earrings. Rainbow Earrings. Swarovski Crystal Rainbow Hoop Earrings. Colorful Bright Hoops. Diamond Shaped Crystal Earrings. Small Rainbow Earrings. Swarovski Crystal Rainbow Hoop Earrings. Colorful Bright Hoops. Gold Crystal Earrings. Small Gold Hoop Earrings. 2 inch Large Gold Round Hoop Earrings. Hand Hammered Shiny Large Gold Hoops. Plain Flat Gold Hoops. Simple Round Hoop Earrings.